You are here: Home » Grovetoberfest Ticket Giveaway!! **Update: The contest has now ended. Congrats to Andy, my winner of the ticket giveaway. Please visit www.grovetoberfest.com to purchase tickets. See you Saturday! Grovetoberfest is right around the corner and, once again, I’m giving away two GA tickets (a $90 value)! Held again at the beautiful Peacock Park in Coconut Grove, Grovetoberfest will be on October 18th, 2014. Your tickets will get you unlimited samples of over 300 great beers, live music, chef demos from some of Miami’s best chefs, a homebrew contest, and you even get to vote for your favorite beer of the festival! If you drink a little too much there’s even a complimentary Safe Ride shuttle that can take you home! Grovetoberfest has you covered in all aspects! Last year over 7,000 people descended upon Peacock Park and I can attest that it was great fun! General admission begins at 4pm (arrive early) and gives you 3 full hours to mingle, sample, and enjoy. *You must have Facebook in order to enter the giveaway. 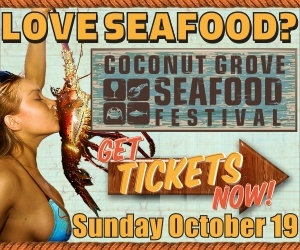 The very next day Peacock Park plays host to another festival: Coconut Grove Seafood Festival! This festival is all about celebrating seafood and Coconut Grove’s laid-back waterfront living. Event-goers will be able to indulge in a multitude of seafood while grooving to the sounds of steel drums, calypso, and reggae. Everything from Bahamian cracked conch, jerk grilled fish, ceviche, paella, and lobster rolls will be served. Casablanca Fish Market will even have a makeshift store where you can buy your seafood to take home after the festival! The event will be held on October 19, 2014 from 11am to sundown. I saw the stuff peppers recipe and I love that recipe!